Heeley Art Club, named because many of the original members lived in Heeley, has survived since 1895, providing members with a source of mutual encouragement and criticism. 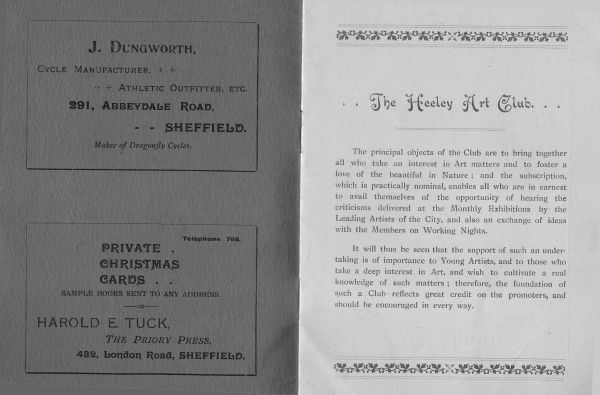 The original members were all amateurs dissatisfied with the Sheffield Society of Artists, dominated by professionals running the society for their own benefit. After a modest start in Thirwell Road Wesleyan School, the club quickly moved to Meersbrook Vestry Hall. 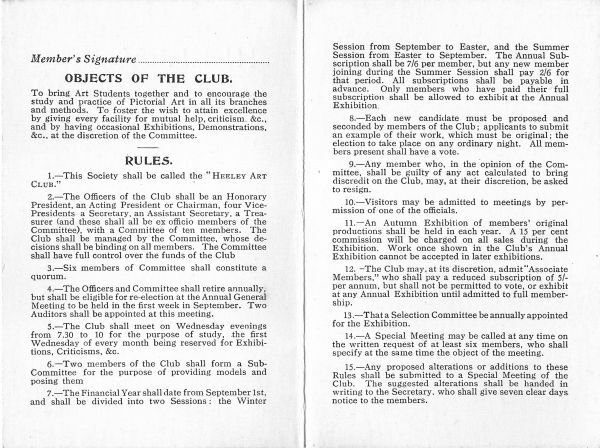 Over the years the club has had various locations. A room in North Church Street was convenient for the local tramps' hostel, which provided models for a shilling a time. Over the years the original aim has changed little. The meetings still encourage both the study and practice of pictorial art. The fortnightly meetings are well supported by loyal and enthusiastic artists, and exhibitions are well attended. At one of the first exhibitions, the walls were crowded with pictures, at prices of from five shillings. Dealers were queueing for the doors to open. Exhibition walls are still crowded but with prices that have gone up just a little! Many of the club members have, over the years, achieved a degree of prominence. Charles Ashmore was famed for his illustrations to Harold Armitage's "Chantreyland". When asked why he sold his pictures for as little as ten shillings he said that it was twice what he could earn as an engraver and much pleasanter to do. A road alongside Graves Park is named after him. In the early twentieth century two members, Arthur Lismer and Fred Varley, emigrated to Canada. They became founders of the "Group of Seven", an influential and now much collected group celebrating the Canadian landscape. Another collectable member was Frank Saltfleet, whose works now feature regularly in the sale rooms. Herbert Slater , owner of the H M Slater cutlery company, was a first class watercolourist and a member for 65 years. He was active as a painter and the club president up to his death in 1978. A wooden seat near the foot of Jacob's Ladder, Stoney Middleton, is dedicated to him. Other early members include W B Hatfield, Tom La Dell, J B Himsworth, H Hill, W Rawson and Sidney Marsden, to name just a few.